I was never a big fan of guacamole, I had tried it here and there and found it to be mushy, mostly tasteless and an unappealing shade of green (Sorry Avi’s I know green’s not easy, apparently Chester feels the same way about being cheesy if that helps… ). Then I tried eating just a plain avocado and found that they were actually kind of addictive. In an effort to spice it up I tried making guacamole from the recipe on the 4 pack bag of avocados I got at my local grocery store and with a tiny addition and a desperate conviction that you DO NOT MASH the avocado (stirring in the ingredients gave it just enough mushy) it was the most delicious thing I’d had in a super long time. 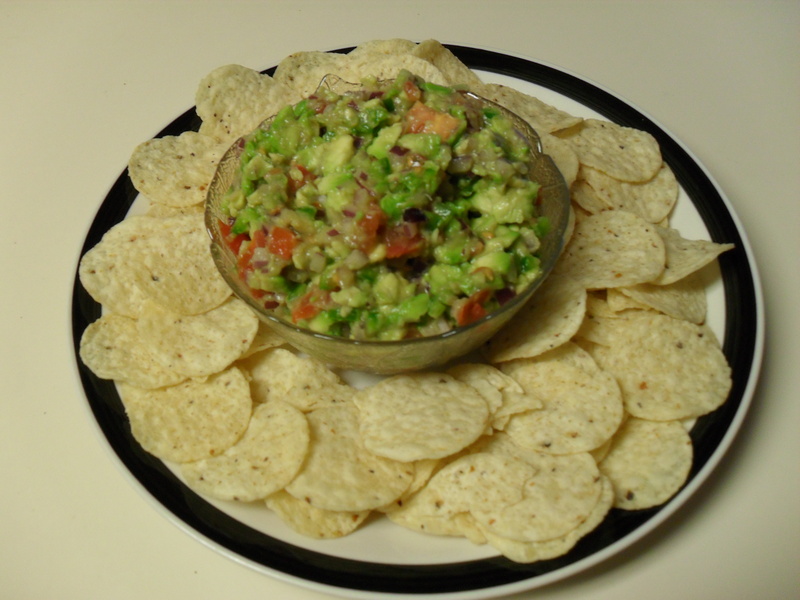 So, if you want a healthy, vegan, delectable dip that’s great with chips I’ll share it with you. What you need: 2 medium avocados, 1/4-1/2 red onion (depending on how much oniony goodness you can handle), 1 large tomato, 1/2 lime, 1 fresh jalapeño, 1.5 teaspoons of garlic powder (or more or less depending on how much garlicy goodness you can handle). What to do: Dice everything but the lime and garlic powder and dump it in a bowl (aren’t I classy). Add garlic powder. Now take your half of lime and squeeze the living crap out of it, that means juice & pulp all go in the bowl over your concoction leaving you with the rind, and any seeds (strangely I never get seeds out of my seedless frankenlimes…but it just makes it easy to squeeze it all over the bowl. This is also an excellent therapeutic tool when you have a bad day). Now stir it a bit to make sure you get a bit of everything in every scoop. You can eat it now. Do you eat guacamole? Do you have a favourite recipe?